The French government is not too happy about being stuck with taken the migrants rescued by the Aquarius 2 ship in the end. After Italy’s Interior Minister Mr Matteo Salvini told the vessel last week that they could go ‘anywhere they like, as long as it is not Italy,’ the ship’s captain decided to head for the French port of Marseille, which means that the French government now has to find suitable haven for the African immigrants. Ever since assuming office in June, Mr Salvini has been closing Italy’s ports to migrant and refugee ships traveling from Libya which has led to a strained relationship between Rome and Paris (and other EU nations). Related coverage: <a href="https://thegoldwater.com/news/37916-Italy-EU-Fumes-As-Salvini-Parliament-Passes-Anti-Migrant-Bill-Making-Deportations-Easier#37921"> Italy - EU Fumes As Salvini Parliament Passes ‘Anti-Migrant’ Bill Making Deportations Easier</a>. After the Balkans route closed when Hungary built in a fence in 2016-2017, African immigrants tried to cross the Mediterranean from Libya, getting to the Italian islands of Lampedusa and Sicily. Ever since then Italy has taken in more than 650,000 migrants, which has placed a strain on reception centres and local services and mean that Mr Salvini’s anti-immigrant Lega Nord was riding high in the polls. 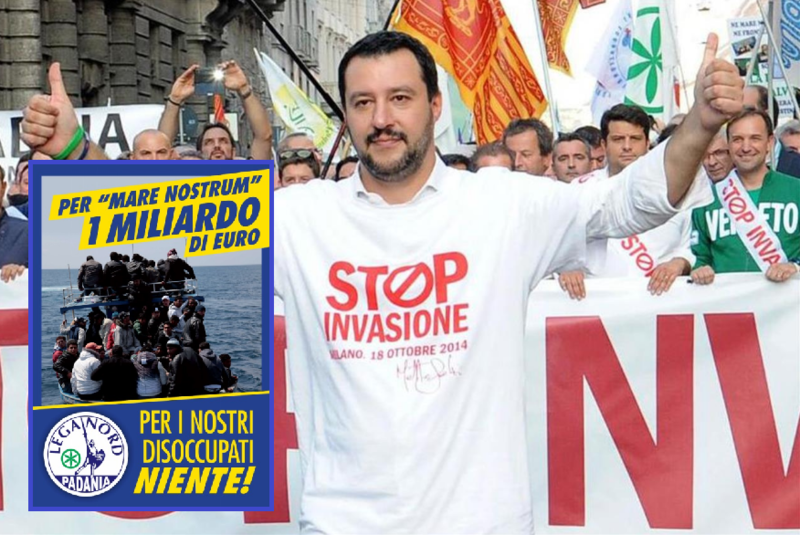 As soon as he was elected to government this year, Mr Salvini closed the route and stopped allowing refugee ships to board in Italian ports, leading to a lot of criticism from other European countries, most notably France. Given that Italy is home to the Vatican, any negative Biblical comparison for a politician is always seen as a grave insult. Seriously impressed with this guy. Italy along with Hungary, Austria and Poland are showing there’s hope for Europe yet. Pontius Pilate left Jesus’ fate to the jews, he saw nothing wrong with Jesus. He told the jews “his blood is on your heads”, the jews shouted back “His blood is on our heads our childrens heads and their childrens heads.” Salvini is no Pilate, he’s a stud! !